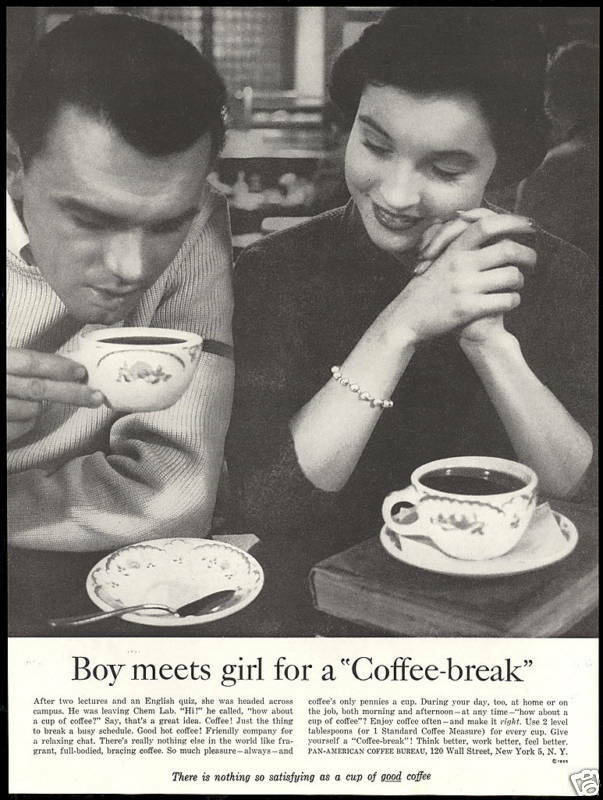 This video features snippets from old coffee ads edited to only include the bits where husbands are really nasty to their wives. Jerks. 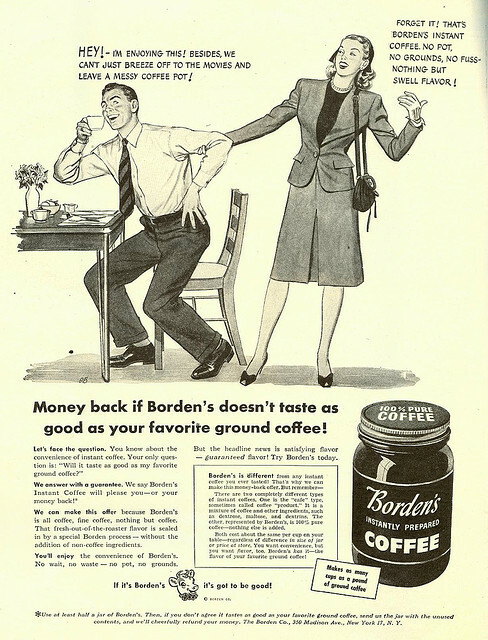 Vintage coffee ads are typically full of snooty husbands – at some stage the advertising industry shifted from husbands that were nasty to husbands that are incompetent. I can’t tell which is worse. I like the idea of charting the progression of a product by charting the qualities used to sell it. 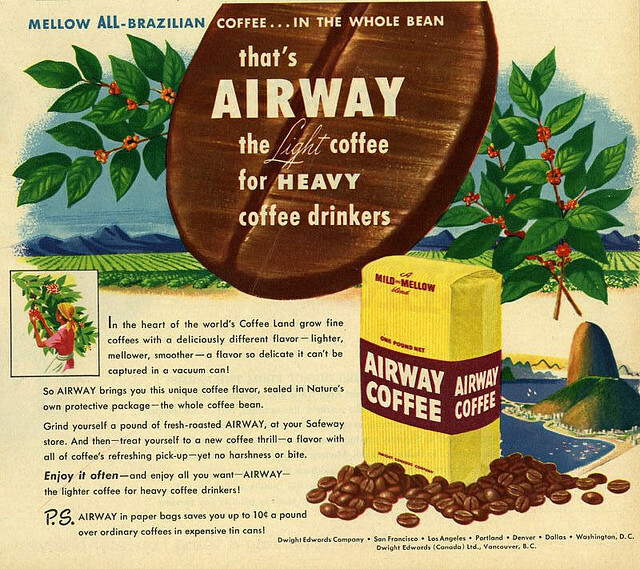 Check out these ads from the vaults of Vintage Coffee Ads, or at least, from the collection of almost 300 ads from around the web (there are some duplicates). 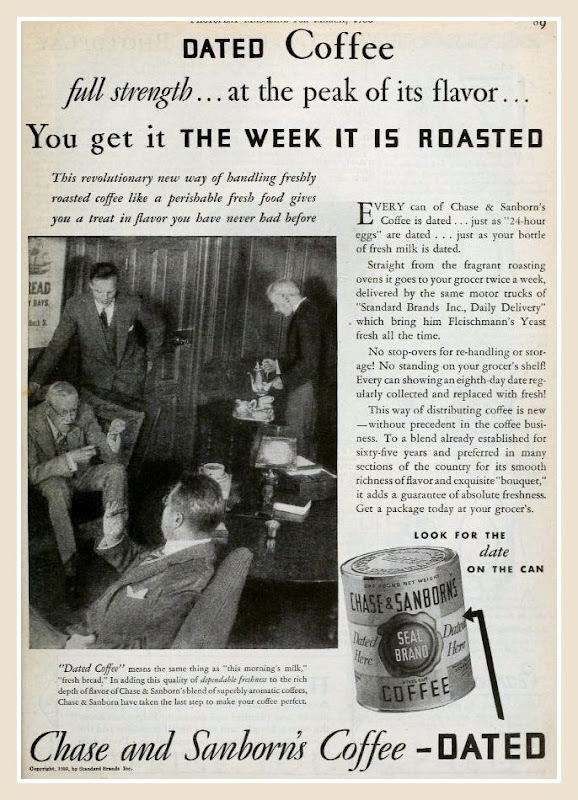 There was quite a bit of scare campaiging going on for a while in the last century surrounding the health effects of caffeine… so the Decaf sellers did what they could to stoke those fires. 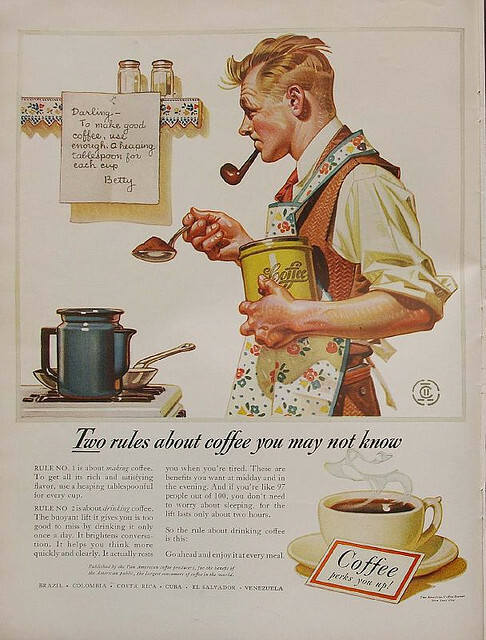 The number one sales pitch for coffee is the combination of flavour and effect that we all know and love. 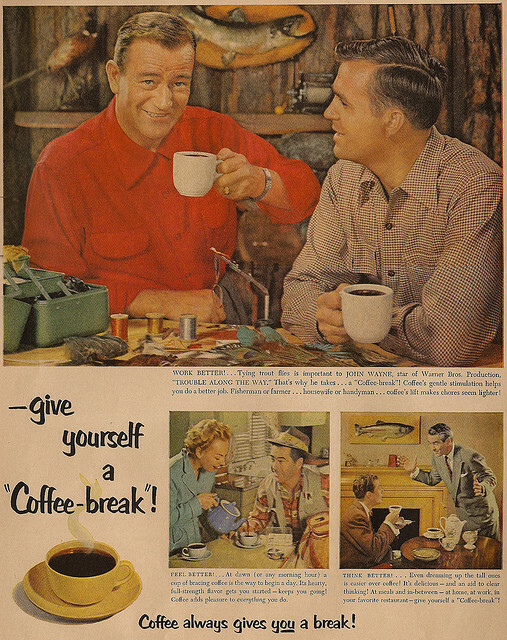 Coffee is nice, and it makes you feel good. So come and get it. It’s true. What they say. 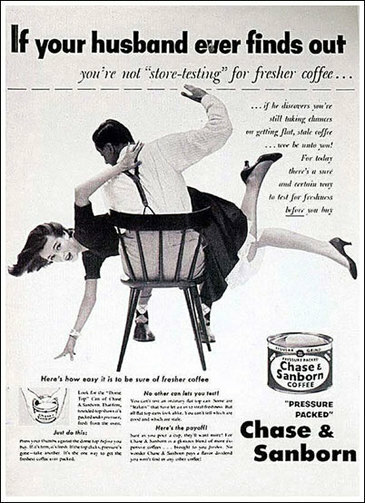 You’ll get further in life if you behave like an adult and drink coffee, and you’ll be glamourous and everybody will want you. 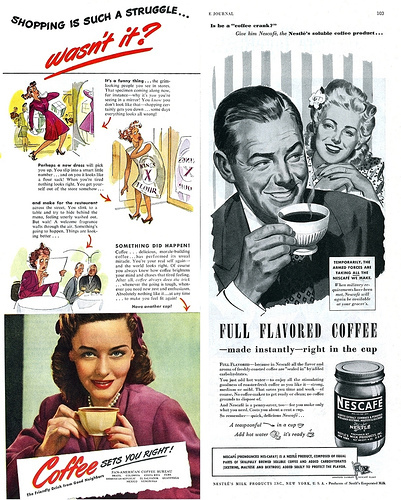 Heaps of coffee ads, right up to the television ads I remember, make a big deal about coffee’s place as a social lubricant. 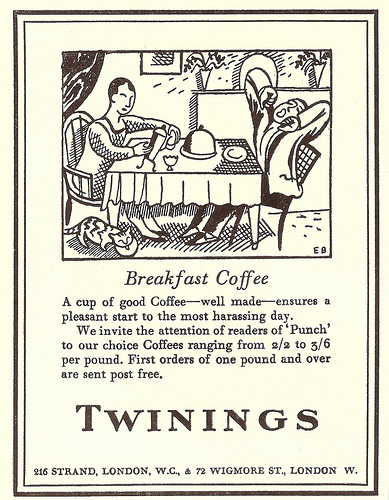 Here’s a verse, about coffee. 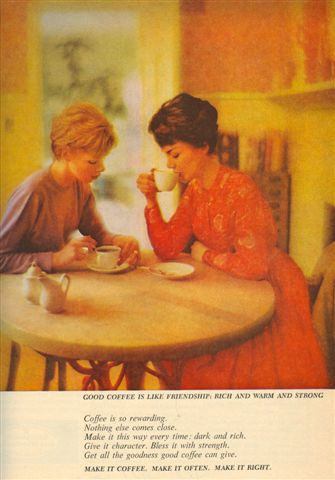 Good coffee is like friendship. 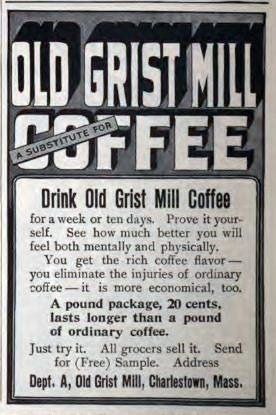 Rich, warm, and strong. 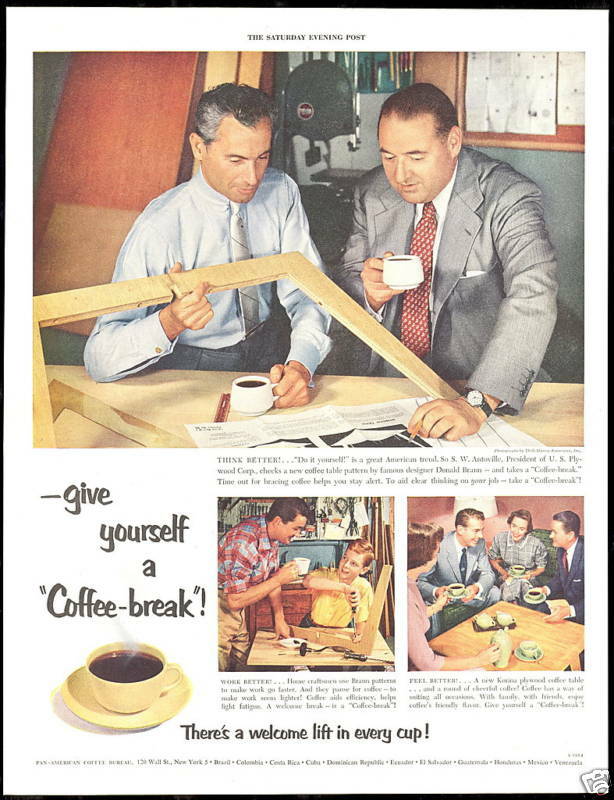 Make it coffee. Make it often. Make it right. 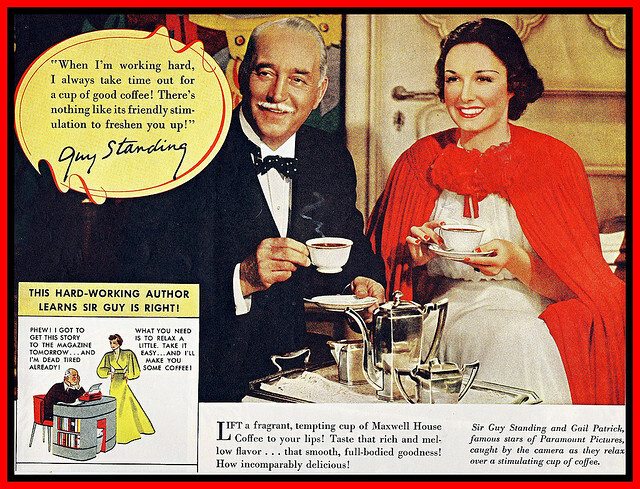 While coffee is good for friendships, it also seems to be the key to domestic bliss. 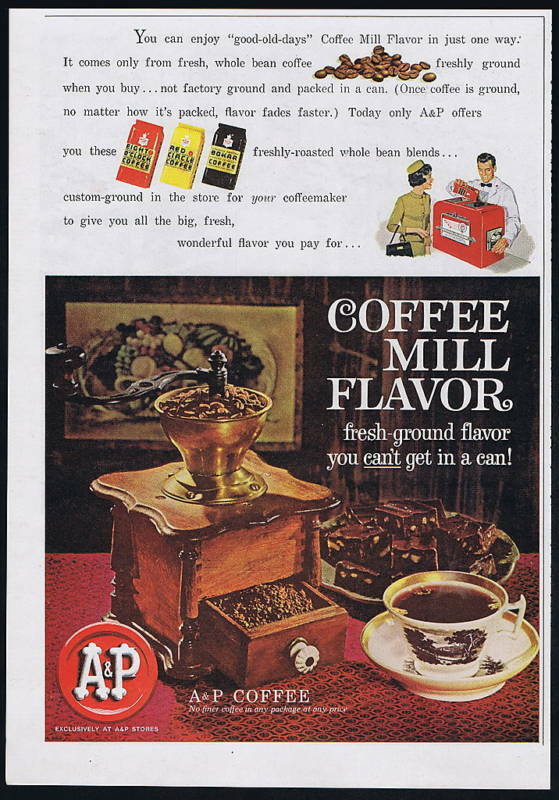 This ad is slightly phallic. Or is that just me? 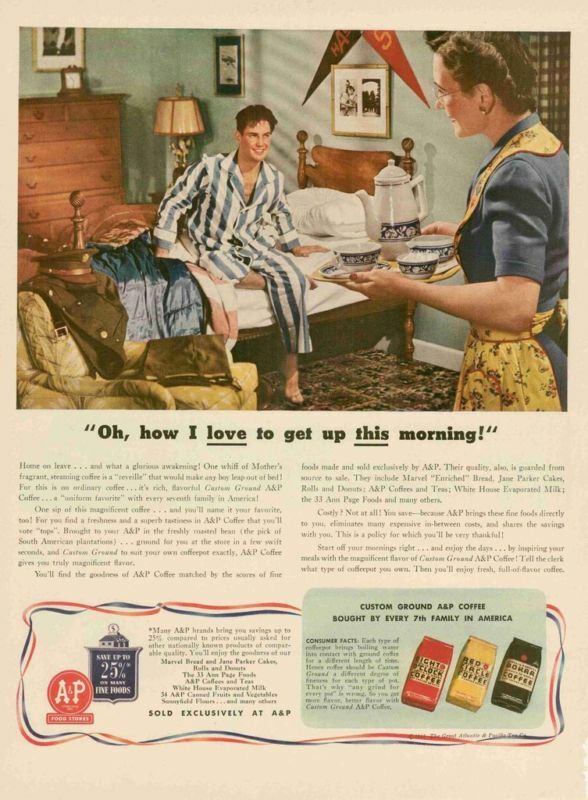 Coffee will pick you up in the morning and keep you going at night. 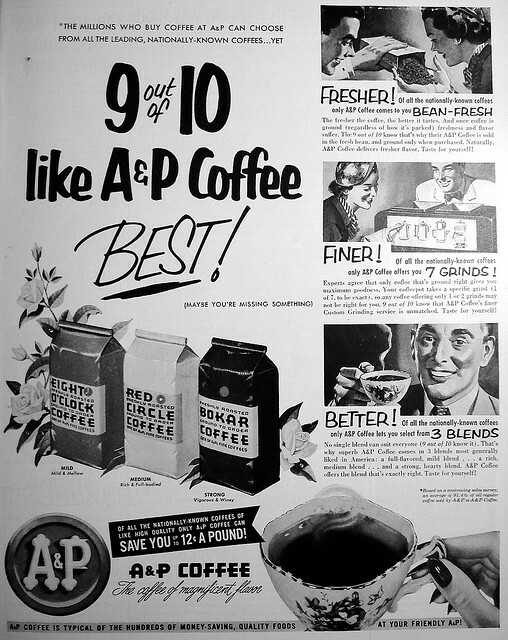 It puts the pep in your step. The string in your bow. 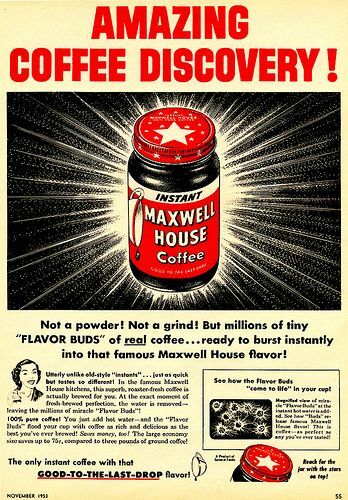 It keeps you going all day. 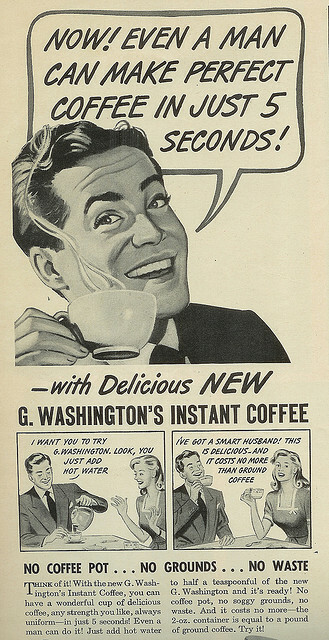 Coffee is delicious. 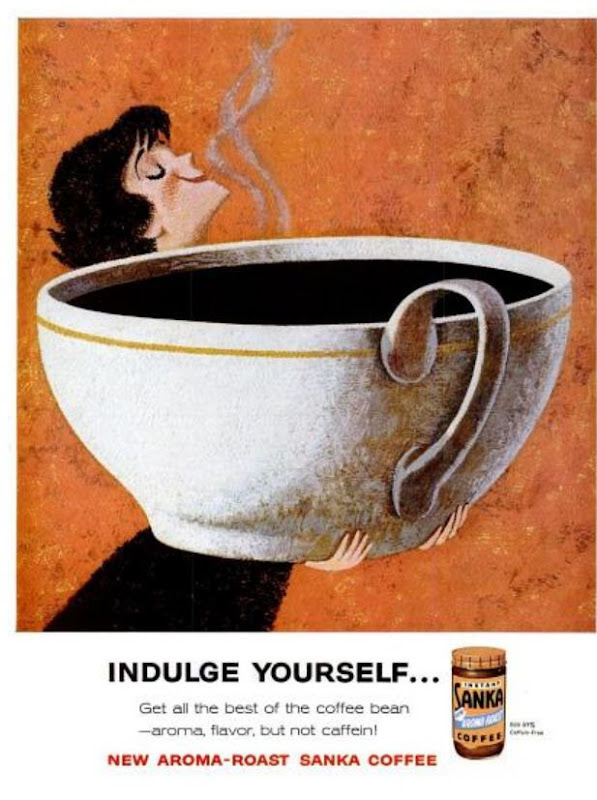 It’s indulgent. 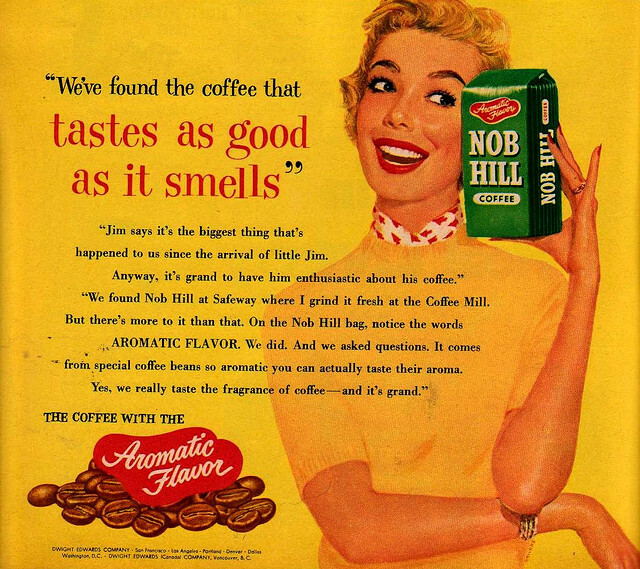 It inspires the taste buds, but it also smells good, and feels nice in your mouth. Flavour matters. 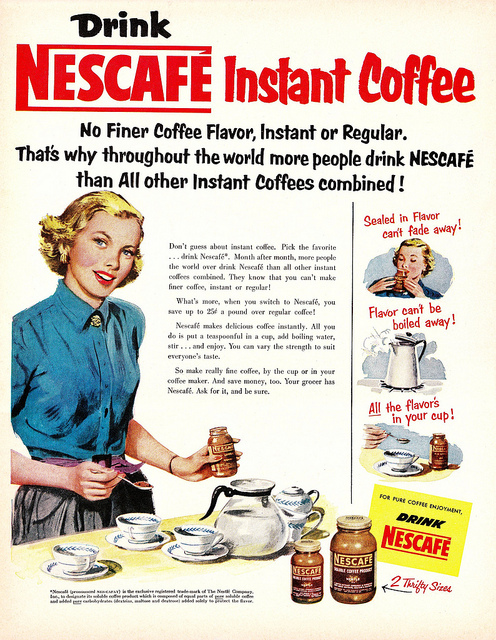 The real appeal of instant coffee is how quick and easy it is to make. 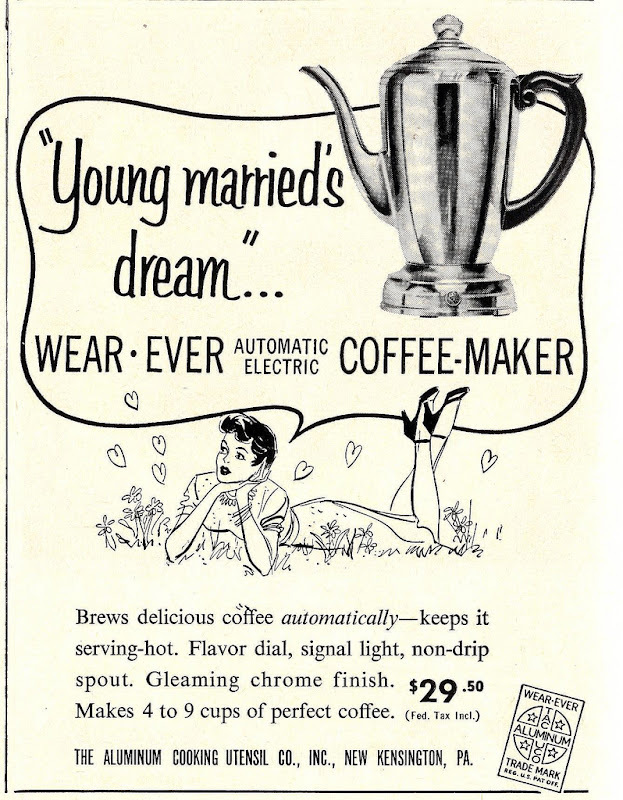 Perfect for the housewife on the go, or the no nonsense man looking to get ahead in life. It should also be simple because men are stupid. 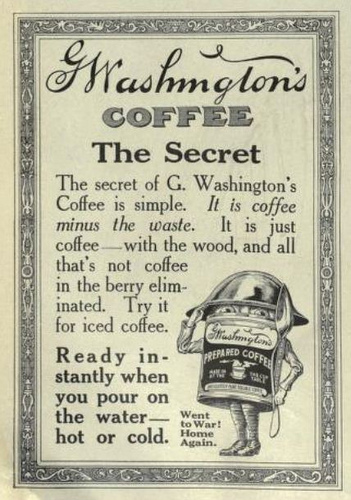 People knew fresh coffee was important as early as the 1930s… or so it would seem. 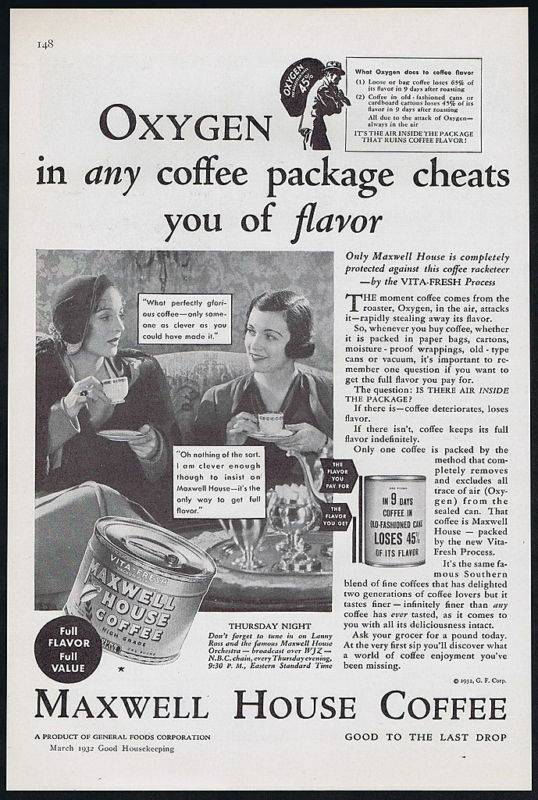 It’s also important to keep the air out of your coffee container. Storage matters. 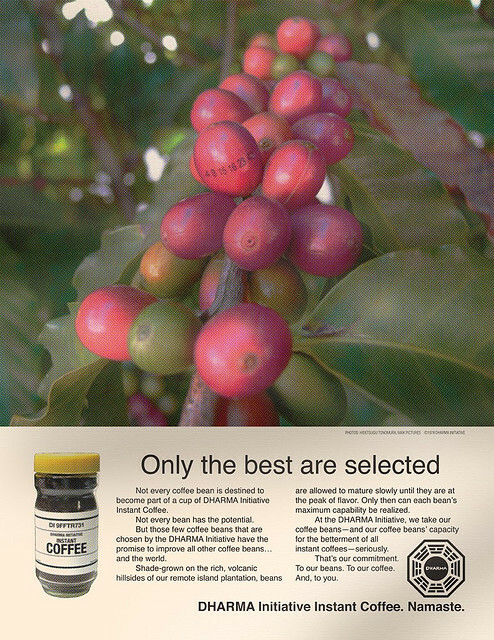 Showing an understanding of the coffee process has always been a good point of difference from one’s competitors. 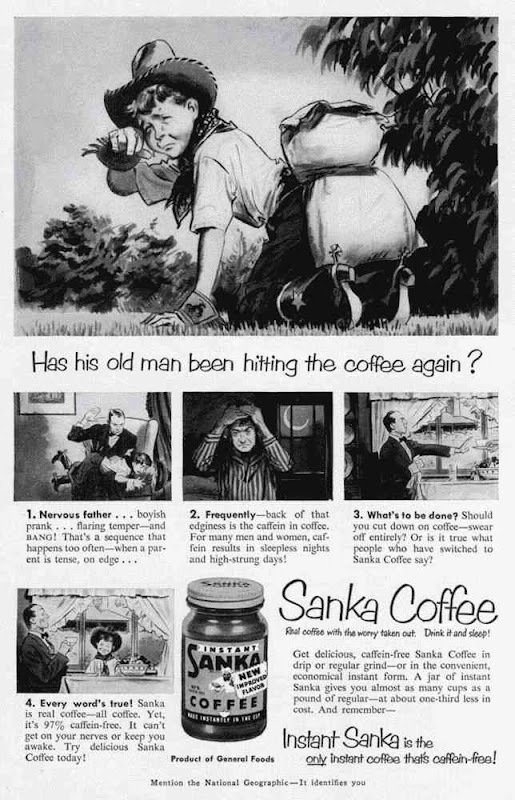 Decaf will make old people nicer. Apparently. And fathers less likely to spank their children, and farmers more likely to milk their cows. 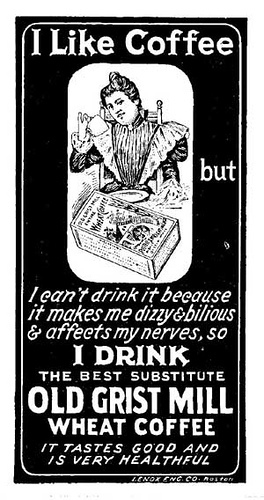 It’ll also stop you hearing the bumps in the night (but it won’t stop the bumps in the night). 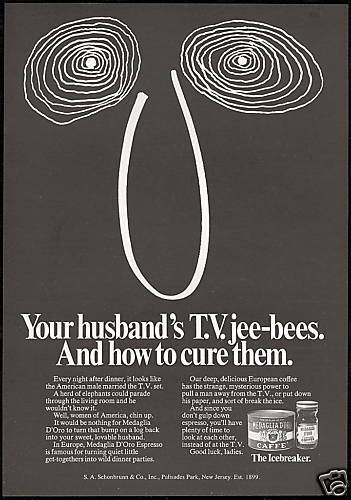 And, if you really want to look after your husband – you’ll unspike his coffee. 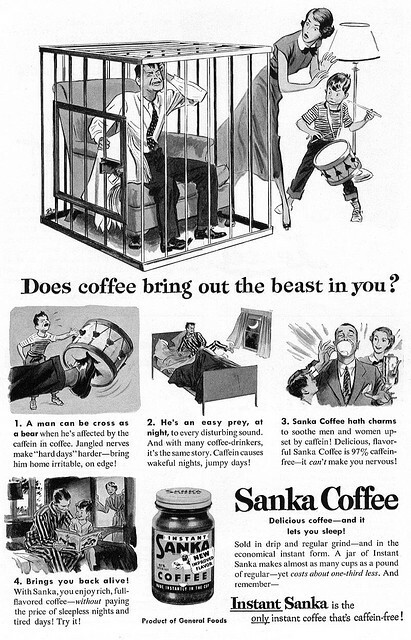 By serving him tasty, tasty, dishwater decaf. 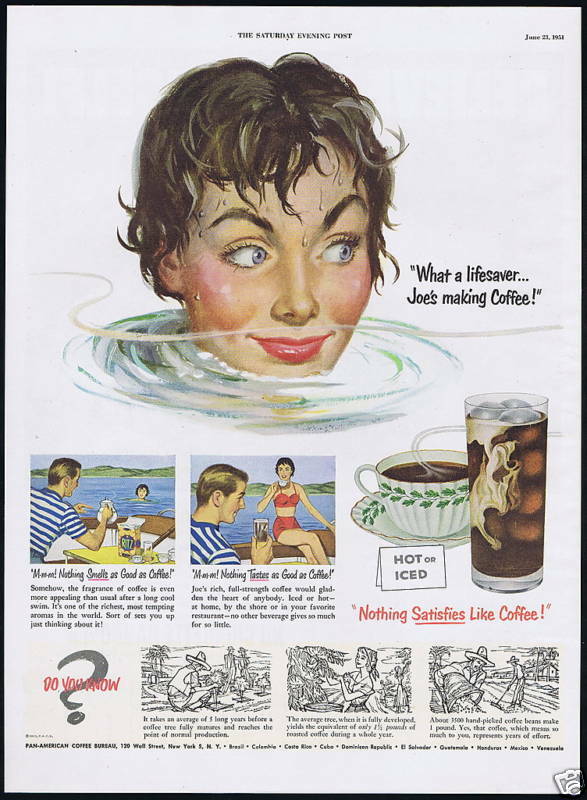 Hot as the sun, or cold as the pole, coffee’s the drink to warm your soul. 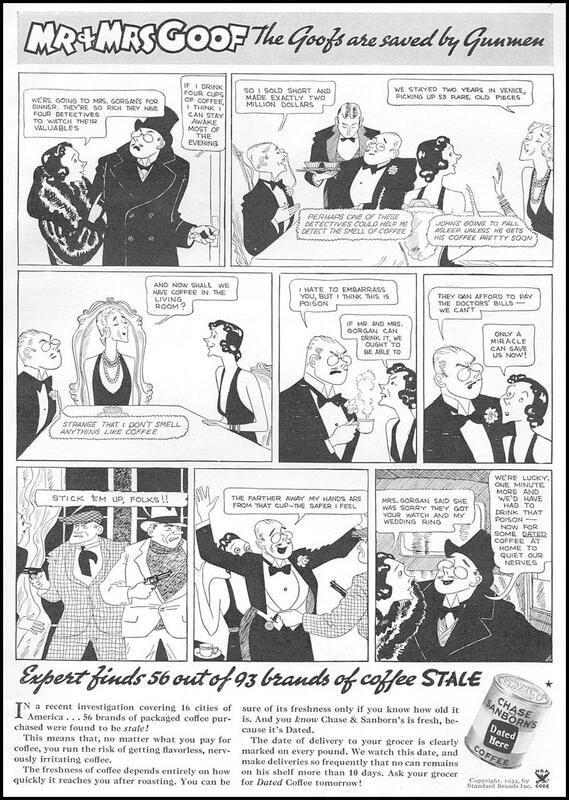 This one is from the 40s. 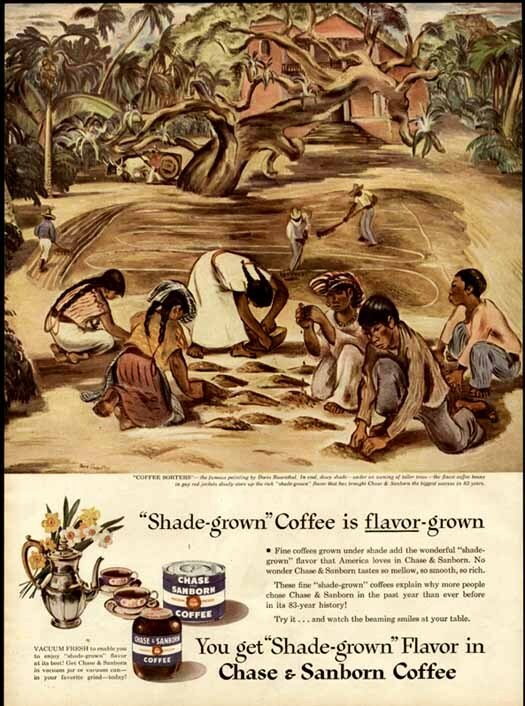 George Clooney, Al Pacino and Roger Federer are modern day examples of celebrity coffee drinkers who have sold their souls for a sub standard product, but celebrity endorsements for coffees are as old as the coffee advertising industry itself. 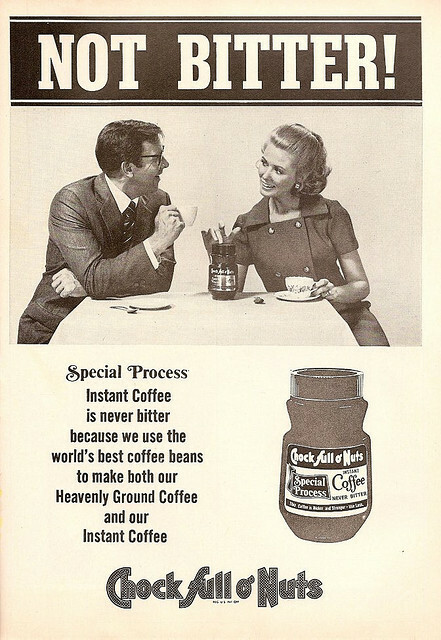 I’ve never seen an ad for instant coffee that presents a semblance of realism or truth. 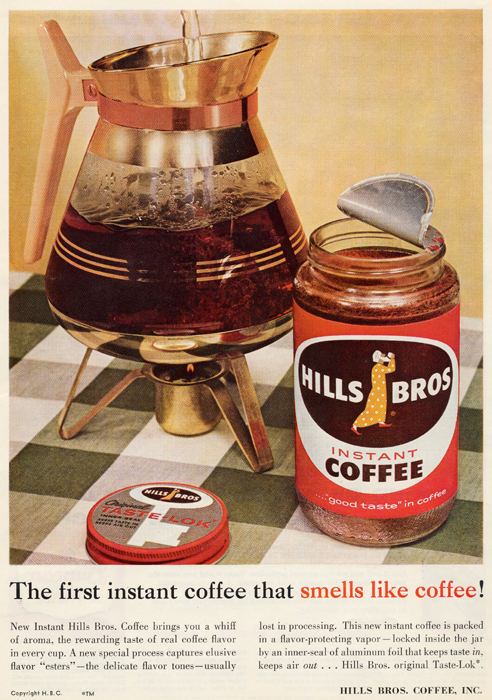 Because I’ve never seen an ad that claims that instant coffee tastes like dirt. 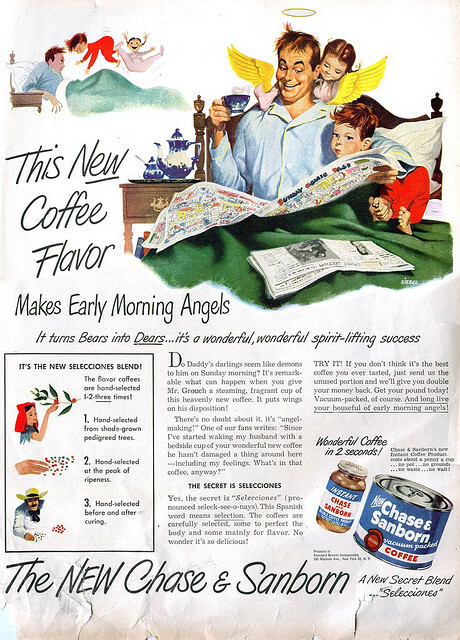 But instant advertisers throughout history really pushed the envelope of truth when they started claiming their product tasted better than the real thing. Here’s where coffee turned classy… and Italian.